The (usually) unarmed elderly plastic training boat HMS Blazer, which some MoD bright spark has classified a Patrol Ship. Photo: Tony Holland/AJAX. A recent report under the aegis of the London-based RUSI think-tank stated that in real terms the UK defence budget as a whole is almost the same size in 2015/16 as it was in 2002/03. In the past decade-and-a-half there have been three defence reviews in Britain. In the 2003 review (under a Labour government), ‘Delivering Security in a Changing World’, the Type 45 destroyer build was reduced from 12 ships to eight (and eventually just six), the number of Type 23 frigates in service was cut from 16 to 13, with the RN paying off early 12 destroyers and frigates. The mine warfare flotilla was reduced and the SSNs cut from 12 to eight. In the 2010 Strategic Defence and Security Review (SDSR), the DDG/FFG fleet was further cut to 19 ships, the SSN build was reduced to seven and specialist amphibious ships were placed in extended readiness or sold off. In the 2015 SDSR there were further cuts all ‘round, though the first of two new aircraft carriers is intended to have an Initial Operating Capability (IOC) by 2018. After repeated cuts, it is surprising that the Ministry of Defence’s recently published ‘UK Armed Forces Equipment and Formations 2017’ shows that the First Sea Lord still commands a fleet of 73 vessels. How can this be? Nine ships are, of course, Royal Fleet Auxiliaries (RFAs). As for the specialist amphibious shipping, which the MoD lists as three ‘Landing Platform Docks/Helicopters’, one of the LPDs is always in mothballs and not available while the LPH HMS Ocean is due to be retired from service in 2018. It has been widely reported that HMS Ocean is being sold to the Brazilian Navy for £80 million, rather less than the cost of her recent refit and will not be replaced. This is, perhaps, only a minor discrepancy compared to other aspects of the MoD’s equipment list. Of the 19 DDG/FFG, two ships are very much in extended states of readiness, so again not available for front line operations. If having only 17 DDGs and FFGs isn’t bad enough – at a time when 30 are actually needed to protect the new carriers and carry out all the RN’s many other global tasks – the MoD seems to be telling blatant fibs in a bid to hide just how bad it really is. If the MoD equipment list is to be believed – there is an impressive force of 22 ‘Patrol Ships’. Granted four of these are the River Class Offshore Patrol Vessels (OPVs) – actual ships, if of limited use – but the ‘22 Patrol Ships’ includes 18 inshore patrol boats. At the stroke of a pen the MoD has included all 14 vessels of the P2000 or Archer Class, which are more properly designated as fast training vessels and belong to the University Royal Navy Units (URNU). The P2000s (displacement 54 tonnes and around 20 metres long) are 30-years-old and are capable of being armed with, but do not usually carry, just one 20mm cannon. The URNU ‘Patrol Ships’ have core, permanent crews and are operated by university undergraduates. The P2000s provide excellent training for young men and women and though the URNUs are not intended as recruiting grounds, through them some first-class people have entered the Royal Navy. They do show the White Ensign in ports where larger vessels cannot go, around the British Isles and across the Channel and the North Sea. Though they are some of the oldest ships in the Navy, there are no plans to replace them. 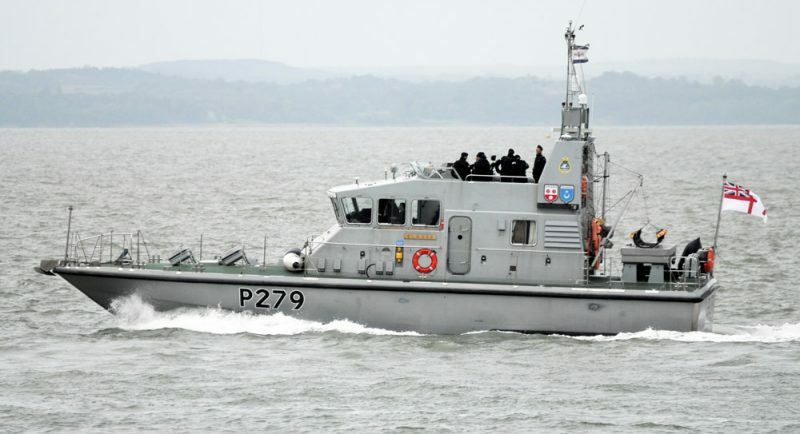 While inshore patrol vessels like the P2000s contribute to the training function and constabulary role of the Royal Navy in a minor way, they do not belong in its order of battle. It is worth noting that the MoD’s equipment report also places the 15 Mine Counter-Measure Vessels (MCMVs) higher in the list than frigates and destroyers. It is truly ironic that with the critical mass in the fighting fleet destroyed by cuts under Labour, coalition and Conservatives governments, the MoD is resorting to the trick of masking the dreadful state of affairs by playing smoke and mirrors with numbers of plastic boats. It certainly won’t fool any Russian or Chinese intelligence officer about the strength of the Royal Navy and will dismay NATO allies. Presumably it can only be intended to ‘big up’ the Royal Navy in the eyes of the Great British Public whom the Govt hopes are too absorbed in other matters to notice (or care). Odin hopes that senior naval officers are not also victims of self-deceit and are telling the truth to those in government who conjured up this whopping great falsehood. For the full version of this commentary buy the September 2017 edition of WARSHIPS IFR.